AOBO 6211 - HANGZHOU AOBO TELECOM.,LTD. √ Support the Gigabit Ethernet ABRing® self-healing ring, with the self-healing time less than 5ms. 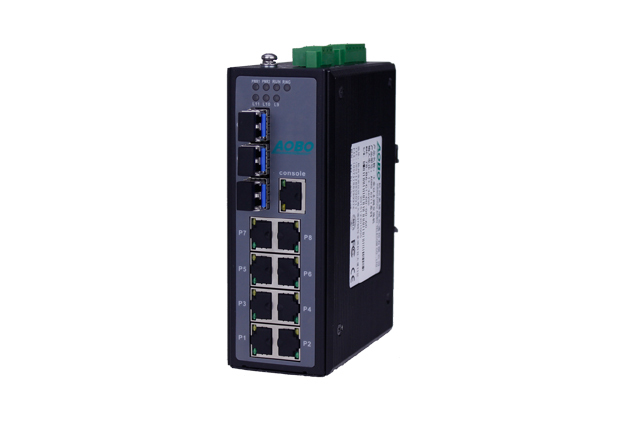 AOBO 6211 series of self-healing ring Industrial Ethernet Switches support 8 Fast Ethernet ports and 1-3 Gigabit Ethernet ports and the users are allowed to build the network structure of the different topology types flexibly based on the actual demands of the industrial environment. The distributed ABRing® self-healing loop technology is capable of improving the high reliability of the industrial network effectively and realizing the self-healing within 5ms.AOBO 6211 series support the rich network management functions, such as STP/RSTP/MSTP, port trunking, IGMP Snooping, ACL and GVRP, and many management methods, such as the SNMP network management, Web, Telnet and ABNet dedicated network management software. This series of switches employ the IP40 metal shell, fanless design and low power consumption and possess the good adaptability to the extreme environment temperature and proper EMC. They can operate stably and reliably for a long time under the adverse industrial environment and have been widely applied to the industrial fields of the wind farm, power distribution net, traffic and petroleum. √ Support ABRing® full-distributed high self-healing ring network, with the network self-healing time less than 5ms.